'Carrying life to people, safe drinking water for all'. This is the mission of Electrosteel, a global, pioneering company that has been fulfilling their pledge for more than 50 years. 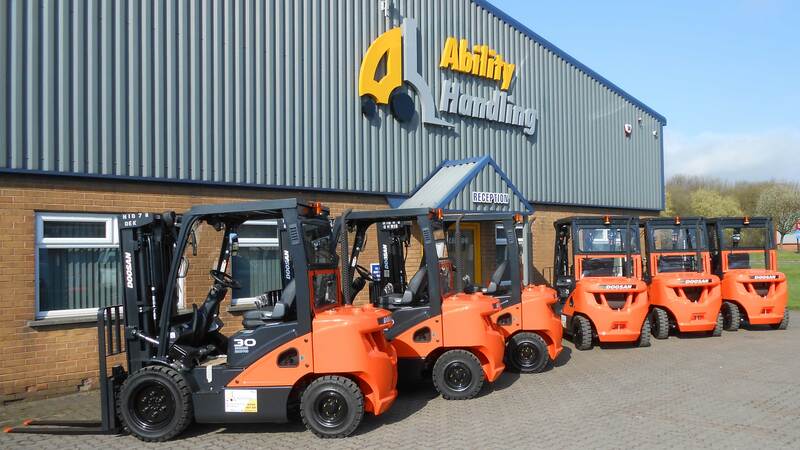 Ability Handling were recently delighted to supply a new fleet of Doosan forklifts to the UK division of Electrosteel, helping the company to continue making its dream a reality. Electrosteel is a world-leading manufacturer of ductile iron pipes, fittings and ancillary products; it was the first company in India to manufacture such items. Now an international company, Electrosteel manufacturing facilities create products with strict adherence to all current international standards including ISO2531, EN545, EN598 and IS:8329. Obviously, meeting all of these standards means that Electrosteel take reliability, durability and safety very seriously. That's why they came to Ability Handling when they decided it was time to renew their forklift fleet. Following trials with several manufacturers' machines, they chose a mix of the new Yanmar engined Doosan D25S-7 and D30S-7 diesel counterbalance trucks. All the trucks were specified with factory fitted self-levelling forks to help prevent damage to products on the higher racks in storage facilities plus weatherguard cabs to improve driver comfort in adverse weather conditions. When the six new trucks were delivered they were so impressed they decided to keep the demo machine too, giving them a total seven truck Doosan fleet! Find out more about Doosan forklifts on our website or get in touch with us today.